To ensure maximum search engine visibility, Guidelight consults with clients throughout the development process on search activities, applies effective layout and design techniques, verifies proper coding, and configures CMS extensions specifically tuned for search engine optimization. Unlike SEO, search engine marketing (SEM) refers to advertising opportunities in which fees are paid to search engines to increase a website’s visibility on results pages. 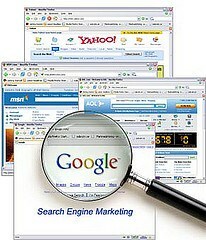 Search engine marketing practices include paid placement, contextual advertising, and paid inclusion. Paid search marketing efforts, such as PayPerClick (PPC), give you greater control over where your website shows up in results pages and for which keywords. For more information about our Search Engine Marketing (SEM) & Search Engine Optimization (SEO) Development Services, or to simply get a quote for your Search Engine Marketing (SEM) & Search Engine Optimization (SEO) Development needs, please contact us.